I said some things you should just look at and think, and decide to remember, and that will stay with you a lot longer than some old snap. That moment has become etched in both our memories. When my son was just five years old, I made my first trip to Hong Kong. Before I left he told me to "Look good with your eyes!" - which, of course I did. Later, when he won a scholarship to Australia, I was able to arrange for him to be picked up during his brief stopover in Hong Kong and taken on a guided tour of the 'sights'. I've heard it said and perhaps to some great truth that we are born knowing many things, and that slowly time and 'teaching' causes us to forget those things. 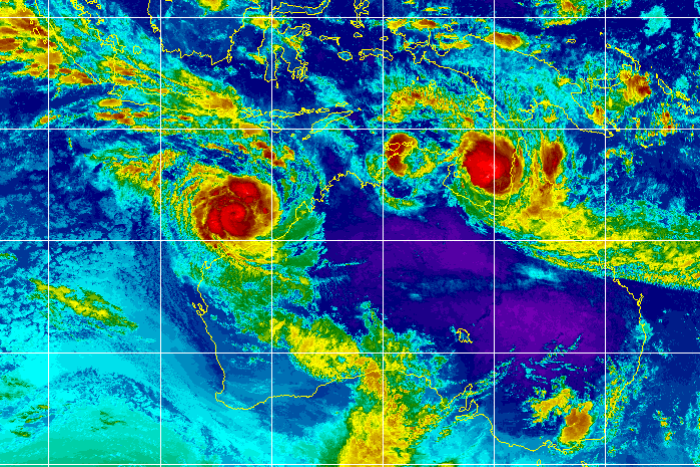 Severe Tropical Cyclone Veronica is starting to make her presence known with cloudy and humid conditions even as far down the coast as Perth. We are in no way at risk but the same can't be said of anyone currently near the Pilbara coast. Currently at Cat.4 and may go to Cat.5 with winds in excess of 200 KmH. Scroll down to the wind map to get a good idea of its size. Hmmm ... that storm is a complete monster. Expected to remain Cat.4 as it crosses the coast, it's packing winds in excess of 200KmH. A chilling warning has been issued by the authorities to the effect that, "If you take risks with your life or the lives of your family, nobody will be coming to save you. Be responsible." A fine sunny Sunday morning at the Hill, if a bit cool. Not complaining. Sending well-wishes acrorst the miles to WA, would not like to be dealing with Cyclone Veronica there, nor Cyclone Trevor in NT. Beautiful late afternoon here: about 25°C outside and within, all windows open for a little breeze. I am golfed, beered and napped on a 30 deg autumn day. Glad that god invented air conditioning. Hatten down the batches, pan the mumps to our friends in Oz. The Southern Hemisphere seems to be taking a battering. Stay safe. And thanks due to our friends in the south for sending the sun north again. Soon the long johns will be back in their drawer. I forgot to put swede in the beef casserole. Maybe tomorrow: I'll find the box of unused hinges..
Last night I oven roasted a nice chunk of pork loin, that cooks up very nicely and only takes two shakes if you're short on time and long on appetite. Also homemade broccoli soup, and some corn which in this season unfortunately only grows it a tin. Gals cleaned 'er right up. Allergy season has begun, box o' tissues never far away. Cherry blossoms just around the corner. Talking of coming home, nice to see you again, Lon. Where've you been? There really is something better than an alarm clock for bringing one instantly wide awake - the sound of a cat throwing up on the bedroom carpet. Cat recurrent vomiting, especially if at a senior age, can be sign of kidney disease. Not the only cause but worth considering. How about the cat throwing up in the night, you are not aware of it. It's dark, you are barefoot en route to the loo and... SQUELCH! My experience with cats, especially the ones that go outdoors, says when they *stop* barfing is when ya gotta worry... means they're not munching everything in sight and ejecting the rejects. Lack of appetite never good. Lost one last year, due to old age. He was a very good boy, caught his not insubstantial weight in vermin every month right up to the end. Oh yeah ... been there, done that hifly! What a great cat he was, Rotty!!! 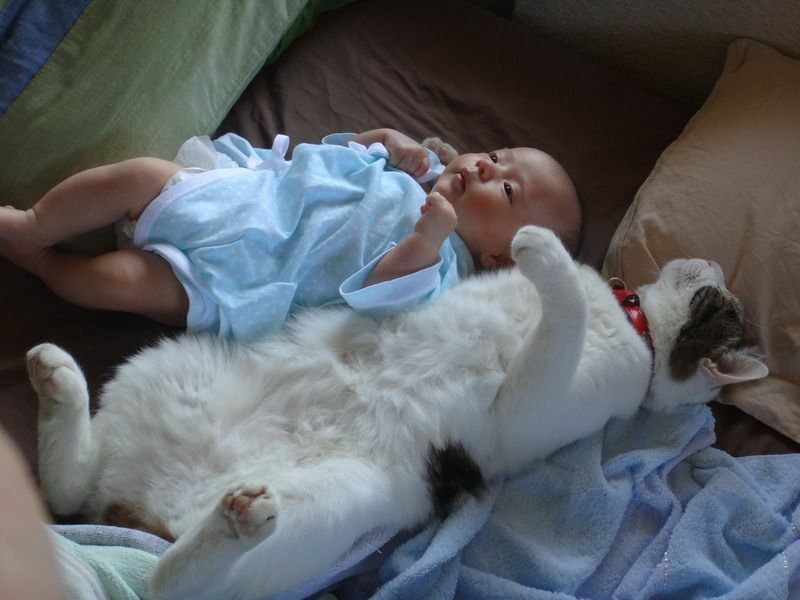 I love that pic of him blissed out and having his cat nap with baby! So, on the way back from a brief 'early doors' (as is our habit), we stop at the Co-op for a couple of basics. I spot a box of 48 'Co-op Peppermint Flavoured Indigestion Relief 500mg tablets' at the perfectly reasonable price of £2.50 (ideal for my occasional, and I do mean occasional, nighttime indigestion resulting from 64 years of food and alcohol abuse) so throw them in the basket. 'Youff' at check out has to call 'manager' to assess whether I am an appropriate person to buy such wholesale volumes of drugs - presumably in case I am likely to retire to a local bus shelter to 'do away with myself' on a drug crazed peppermint flavoured binge !! WTF is happening to the world ? Last edited by Senior Paper Monitor; 26th Mar 2019 at 20:02. I'M NOT WEARING THE SAME DRESS AS SHE IS! !